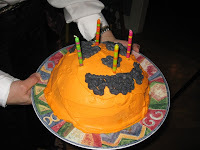 The birthday party, with the Halloween theme, the jack-o-lantern ice cream cake with whipped cream frosting, the trays of food and the happy young children, is over. After a little break it was time to start up the meyer lemon marmalade process again. 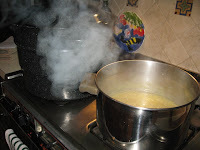 The lemons boiled for about 45 minutes with the contents of 2 vanilla beans, plus the beans themselves. Then 4 cups of sugar, then cook some more to get it to gel. Then into the jars and process for 5 minutes. This is marmalade I will actually eat! I just finished (not 20 minutes ago) another batch of sunshine jam. I ended up chickening out on the vanilla, simply because I was out of jam and didn't want to risk it with the first batch of the season. :) I'm doing another tomorrow with rosemary. I ended up steeping the rosemary because I couldn't find any cheesecloth, and will use the steeping liquid as the water in the recipe. A lot of recipes didn't have the vanilla at all, but I see no reason why you can't use extract. 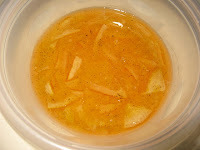 With the vanilla pear jelly I used twice as much as recommended... so 1-2 teaspoons ought to be fine.